Marble tiles are an ever-elegant addition to any home, especially in the bathroom. Your bathroom should be a hub of relaxation, boast elements of cleanliness and be timeless in its design. 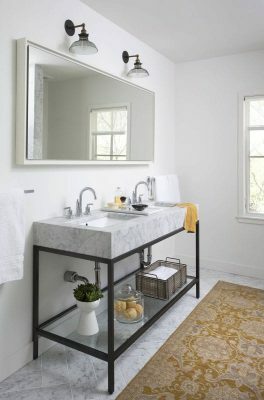 The styling of your bathroom does not solely rely on the towels you have hung or the cup holder your toothbrush lives in. The style of your bathroom begins with the bathroom tiles. Whether they are colourful, a statement or reminiscent of the seventies, if your bathroom tiles are outdated chances are your bathroom feels that way too. Beyond a trend or fade, marble tiles will never outdated. There are many reasons you should add marble tiles to your bathroom. Have you ever seen a bathroom clad in marble and not automatically thought of luxury and romance? There are many small ways you can add marble bathroom tiles you are chasing this highly sought after modern romantic aesthetic. Changing your splashback bathroom tiles can make a dramatic difference in your bathroom. By playing around with different shapes, sizes and textures you can create an entirely different bathroom look. RMS Traders’ Bianca Carrara Penny Rounds Marble Tiles are sophisticated, unique and will add a dynamic element to any bathroom wall they inhabit. There are almost no limits as to where marble can be used. As marble is a natural stone, each piece is completely unique. The textures, patterns and sometimes even shades vary from piece to piece. Even though each piece is unique, marble tiles remain uninformed. Mixing different shades and patterns between floor, wall and accent pieces creates a striking dynamic and can really dress up any bathroom. Why not match your marble bench top to your marble floor tiles? You could use light coloured marble to attract light in the room, or use black tiles for a dramatic, modern contrast. Try RMS Traders’ Nero Maquina Honed Marble Hexagon, a black marble that will add a modern twist to any marble bathroom tile collection. Once marble bathroom tiles have been installed and sealed there is no need to use harmful chemicals to clean them. Infarct chemicals can damage marble tiles and contact should be completely avoided. A win for the environment and yours and your families health, marble bathroom tiles only require soapy water and a good scrub to remain clean. Whether you wish to have a floor-to-ceiling marble tiled bathroom, or you are looking for some timeless accents, RMS Traders marble collection will cater to your design and durability needs. To request a quote for your project, contact us or visit our Melbourne Showroom and we will help you create the bathroom of your dreams. This entry was posted in Marble Tiles Articles. Bookmark the permalink. Decorate your house spaces with Travertine!